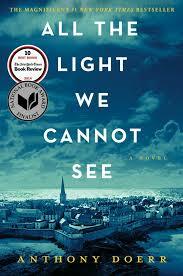 a book chick: "All the Light We Cannot See"
my take: Sometimes I do weary of World War reads. How, after 70 years, can we still be mining for original stories? Is there no end to it? This is a WWII story that is so vastly different from others that I sometimes forgot the WW chip on my shoulder. Part mystery, part page turner, part heart-breaker ... I read this in two sittings. Mr. Doerr takes the elements of radios, orphans, museums treasures, and blindness and whirls them together in a tale that encompasses the war from a French and German perspective. The title is mind-bogglingly rich. The majority of the French perspective happens in St. Malo, a small, walled, coastal city on the Atlantic. I double dog dare you not to want to visit after reading. Hubby, mother, aunt, and I did on our spring trip to France. Worth a read and worth a visit. This is my current favorite book. I keep recommending it to anyone who asks for a good read (and to many that don't). And I agree, the title is just WONDERFUL. I loved the mystery/page turner aspect of this one. And those characters! The St. Malo location really is one too... I think I need to tack that on to my (when the heck is it going to happen) Paris trip. It's here! All the Light We Cannot See Audio Book is available on AudioBooksNow.